There’s a lot of miracles associated with the various relics of the True Cross, and obviously nobody can know them all. In Venice, however, there are a lot of famous paintings referring to particular miracles that happened around there, so it’s helpful to know the story! 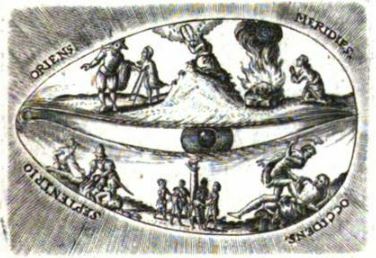 An Incunabulum of the Miracles of the True Cross of the Scuola Grande di San Giovanni Evangelista, by Patricia Fortini Brown. The article also notes that Bellini’s “Procession in the Piazza San Marco” is yet another miracle story!!! I didn’t know that!! The painting shows the procession, big just like in real life, with the True Cross under a canopy in the fashion of a Eucharistic procession. Meanwhile, between the procession members and almost at the feet of a candlebearer, we see that one red-robed merchant kneels at the side of the procession. He is praying for the health of his son, and he will return home to find the boy completely healed, from the moment of his prayer. So it’s life in the big city, where we don’t always see grace happening or understand the most important moments. It also allows all the confraternity members to get their picture taken, because the faces of procession and crowdmembers are Venetians who helped fund these kinds of paintings. Apparently this offends a lot of art critics. Eh, I think they are over-nice in their tastes. Everybody likes to have their picture taken, and it is doctrine that there is always a “cloud of witnesses” around every event, much less historical events. Donors always got their picture taken in the Middle Ages, and it seems to have helped the piety of donors to be able to picture themselves “being there.” It may have annoyed some of their neighbors, possibly; but even today, most people like to see their neighbors or friends or family in a realistic mural. I suspect that this sort of painting was an outgrowth of the pious idea of meditating by picturing oneself as present at various Biblical events; and some people seem to like picturing themselves with their friends and family in such meditations. Nothing else weird happened until they tried to take the True Cross piece to the funeral of a confraternity member at the Church of San Lio. The member had refused to participate in any of the processions or go to anybody else’s funeral, including those of confraternity brothers; and he secretly had lived a bad life, visiting brothels and taverns often and apparently dying unrepentant. People in the lay confraternity were vowed to live a pious and decent life, and to help out with the processions and funerals, so he also died breaking his promise. So the piece of the Cross refused to enter the church and be perceived as honoring this guy. The painting, “Miracle in the Campo San Lio,” shows the neighbors all watching this embarrassing scene from their windows. Eventually they just used a regular cross from the church for the funeral. St. Lorenzo Giustiniani (aka St. Lawrence Justinian) was the first Patriarch of Venice, because it was in his time that the Pope folded the patriarchate of Grado into the archbishopric of Venice. But he was also known for writing books (sixteen or seventeen of them! ), and even for writing songs. Anyway, here’s a praise song (“lauda”) with lyrics atributed by Joglaresa to the protopatriarch, St. Lorenzo: “O Madalena che portasti”. It’s a song about St. Mary Magdalene. Joglaresa.com says it’s “Number 91 from the Laudario Giustinianeo – MS40 Biblioteca dei Padri Somaschi della Salute.” They say they took the tune from a different lauda by somebody else: “Fa mi cantar amor de la biata” (“I’m going to sing my love of the blessed woman”) – from the Cortona Laudario (C. 19 v. / 22 r.). A lauda, or “lauda spirituale,” was a vernacular song dealing with holy or sacred subjects (like the lives of saints). But they were devotional in nature, sung at home or in religious confraternities of laypeople, or sometimes on the street for processions, rather than being sung in church. They were also used to comfort and cheer up prisoners facing execution or people who were dying. So basically, the same sort of thing as a carol or villancico. “So what has upset the Banshee about what the Pope has been doing today?” you may wonder. Pope Francis has announced that from now on, footwashing rites on Holy Thursday will not be performed on “viri selecti” (adult men who’ve been picked) but rather, on “selecti” (men, women, kids, heathens, whoever). So let’s lay out the arguments. PRO: Since the Pope does control liturgy, and since footwashing subjects are a matter of practice and not doctrine, it is within the Pope’s power to change this stuff. A lot of parish priests have long turned “viri” into “altarboys” (ie, substitute acolytes who are “pueri,” boys). A lot of Protestant groups have always washed each other’s feet, or at least they’ve done it since the 1930’s or the 1970’s; and a lot of progressive parish priests wash the feet of men and women. So the Pope is just making the rules conform to the actual practice on the ground. Hurray for fewer sins of disobedience and liturgical abuse! CON: The Pope is supposed to protect the age-old liturgical practices of the Church, not mess around with them at will. The primary reason Jesus washed His Apostles’ feet was that He was doing the same thing Moses did, when Moses made Aaron and his sons into priests (sacerdotes, that is, not presbyteri). The humility lesson was an attached moral of the story. Jesus therefore did not wash His mom’s feet, the feet of any of the women disciples, the feet of any of the men disciples who weren’t being made into priests at that very moment, or the feet of any kids or babies. There’s a reason why footwashing was traditionally done by bishops. Having priests wash the feet of altarboys may have seemed supportive of vocations back in the 1950’s, but in retrospect it was a stupid overreach that has led to more stupidity. And of course some Protestant groups wash everybody’s feet. It’s usually the same Protestant groups that don’t believe in bishops or priests, so of course they want to have everybody taking on the powers of bishops, and they have no grounds for differentiating between men and women in relation to a theology of clerics that they don’t believe in. That’s what they do! EITHER WAY: Most of the Fathers who talk about humility also talk about footwashing as a symbol of avoiding impurity in the Christian life by “washing it off” with repeated penance, and a reminder of Baptism (because Peter had already been “washed all over” in his Baptism by Jesus). It’s also mentioned in many places that Jesus washed Judas’ feet, and that it was the last kindness and the last plea to him to stop sinning. Accepting the washing of feet is like the sinner who is contrite and does penance before daring to receive the Eucharist; Judas is an example of someone who doesn’t really repent, but goes to Communion in his sins, with full intent to do Jesus deadly wrong. The ablutions of Jewish priests before entering the Temple were also a type of going to Confession before Communion. Jesus’ threat to cut Peter off if he didn’t have his feet washed was His threat to refuse Peter the Eucharist. (St. Cyprian and St. Augustine both talk about this.) Jesus then mentions Judas as the one who is not clean, and as the one who eats his bread but will lift up his heel against Jesus (a quote from the Septuagint version of Ps. 40:10/41:9). St. Basil in his Discourse on Sin says that the moral of the story is that whatever God says, we need to accept with our whole heart; and that no matter how good and pious and loving our intentions, disobedience to God’s commands will cut us off from Him. St. Ambrose also mentions that the early Christians in rural areas did footwashing in the home, and not just as a Holy Thursday thing but as an everyday practice of humility. This is a sign that we are supposed to help each other stay clean of sin, and that humility and penitence helps that cooperation to fight back against evil. If people really want footwashing for both sexes, they should do the traditional thing, and wash feet on Holy Thursday but not at Mass. For example, it used to be the custom for various charitable organizations, priests, kings, etc. to hold footwashing in public squares or nice warm buildings. Generally the people whose feet were washed were either beggars or pilgrims, and they were given gifts of money (“Maundy money”) after the footwashing was done. Often they were also given new shoes and socks, entire sets of clothes, or meals served by the footwashers. Women’s feet were usually washed by women dignitaries, and men were forbidden to be spectators. This is stupid when done at Mass. If we’re lucky, it will die out quickly. Also, do me a favor and don’t touch my feet. Medieval Otaku introduced us this week to the work of a famous saint of whom I only knew the name! He started as a child worker replacing bobbins on the spinning jenny in his father’s little weaving factory, became a weaver himself, and then went on to study loom programming and graphic design, as well as becoming an engineer, inventor, and businessman. But then… he gave it all up to become a priest. Because I wanted to improve my knowledge of manufacturing techniques, I asked my father to send me to Barcelona…. My first move was to submit a petition to the Board of Trade for admission to classes in design…. One day I told the shop superintendent that the pattern we both had in hand could be worked out in such and such a manner. He took a pencil and drew a plan of the way the loom should be set up for the job. I made no comment but told him that if he didn’t object, I would study it. I took the pattern and his sketch for the loom-setting home with me. In a few days I brought him a sketch of the setup needed to produce the pattern and showed him how the one he had sketched would not have produced the pattern in question, but a different one which I also showed him. My only goal and all my anxieties were about manufacturing. I can’t overstate it — my obsession approached delirium… I loved to think and dwell on my projects, but during Mass and my other devotions I did not want to, and I tried to put them out of my mind… My efforts seemed useless, like trying to bring a swiftly rotating wheel to a sudden stop. I was tormented during Mass with new ideas, discoveries, and so on. There seemed to be more machines in my head than saints behind the altar. The job was impossible, but nothing was impossible with God. Then, all of a sudden, he was appointed Archbishop of Santiago, Cuba, and had to sail across the ocean! His job was to be a fixer and missionary under horrible circumstances, to try to stamp out the slave trade which persisted in spite of Spanish law, and to teach an island full of priests who barely knew Latin or how to say Mass. He brought in new priests from Catalonia under the new Catholic-friendly climate, and set up classes for the priests he already had. He also set up hospitals, schools, and nursing homes, as well as parish savings banks that doubled as credit unions. He was archbishop for six years, and his tenure included the great Santiago earthquake (when he was observed to stop some aftershocks by touching the ground with his hand) and the cholera epidemic that followed it. It also included a couple of attempts on his life, including a knife attack that left him with slurred speech and terrible scars on his face and arm, and a bout of yellow fever. The bishop was called back to Spain (accompanied by some awfully suspicious “accidents” that failed to kill him or sink the ship) and made royal chaplain, as well as president of the Escorial Monastery. He reestablished religious in the place, restarted the local seminary, started schools and libraries and agricultural teaching farms nearby, and restored or replaced the Escorial’s priceless art treasures after long neglect and damage by war. His days started at three in the morning, and included both intense prayer and hard work for others, as well as giving away huge quantities of alms and free books. Things got crazy again in Spain, and soon the queen was dethroned by a Communist revolt. St. Anthony Mary Claret went into exile with her, but his work was not done. Called to attend the First Vatican Council, he ended up addressing the craziness at Vatican I, making truly magisterial and saintly speeches. “The first, as Jesus told Saint Teresa [of Avila], is that men do not really love God. The second, that they lack humility. It is written: ‘I confess Thee Father Lord of heaven and earth, because Thou hast hidden these truths from the wise and those prudent according to the world, and revealed them to the humble.’ Third and finally, there are some who do not wish to understand Scripture — simply because they do not wish the good. But although he won his fight, the stress of hearing his fellow bishops talk junk instead of sense brought him bad health, and then a stroke. He returned to the Claretian Fathers in France almost unable to speak or stand. He had further nerve attacks, and then the government threatened to arrest him. He was taken into hiding among the Trappists at Fontfroide, and soon entered upon his last illness. He spoke of perhaps starting a mission in the United States, which the Claretians later did. He died a painful but holy death on October 24, 1870, and the bells of a nearby convent of nuns rang out with noone to ring them. When his body was exhumed 27 years later to be taken back to Spain, it was found to be incorrupt. So yeah, the reason we don’t hear about this guy is because he is a challenge, because he fought Communism and other leftist movements just by proclaiming the Gospel, and because his modern life included real Apostolic fervor, results, and miracles. This sort of thing makes people uncomfortable, because it demands that we do something, too! It’s also fairly obvious that St. Anthony Mary Claret should be named a patron saint of programmers, because he did the job back when it was still Jacquard looms. 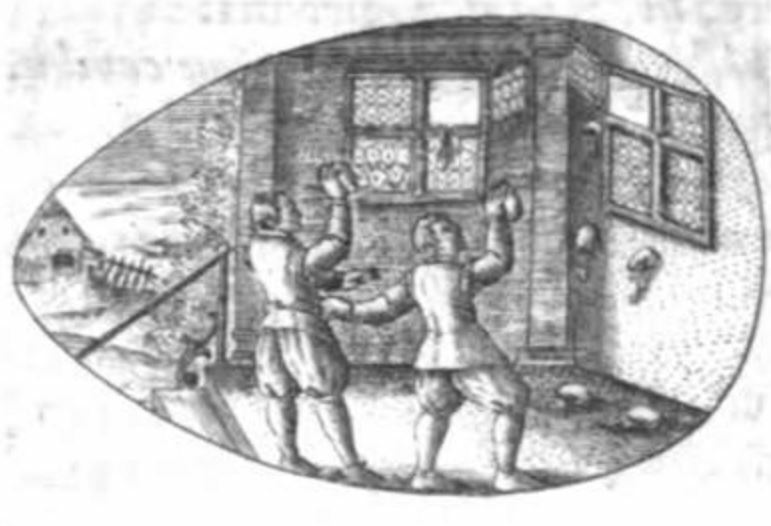 I’ve been reading Georg Franck of Franckenau’s essay from the 1600’s, “De Ova Paschalia” (On Easter Eggs). In it, he says that the Easter Hare actually stole eggs from the hens, then magically dyed them and hid them as mischief. The kids were then charged with finding and bringing them back. This article makes an interesting point, linking the Easter Hare or Easter Bunny to an old motif found around the world, but in Germany used as related to the Trinity. It’s a motif where three rabbits were drawn in a circle so that all three rabbits had two ears each, but there were only three ears drawn in all. This is called the “Dreihasenbildes” or Three Hares motif. Apparently it was very common to draw the Dreihasenbildes on Easter eggs, often with each hare in a different primary color. Medieval Jews have a similar motif in their synagogues, but there it represents the people of God as weak but protected by God, based on earlier translations of Prov. 30:26 (“The bunnies are a weak people who make their bed in the rock”) and Ps. 103:18/104:18 (“The high hills are a refuge for the harts, the rock for the bunnies.”) Christians interpreted these verses similarly, but regarded Jesus as the Rock. The same article says that there was also a group of more benign animals who delivered eggs: the Easter hen (in the Tyrol), the Easter rooster (Upper Bavaria, Thuringia, Schleswig-Holstein, and Austria), the Easter fox (Hannover), the Easter stork or Easterbird (near the Netherlands), the cuckoo (in parts of Switzerland), and the Easter lamb (some parts of Upper Bavaria). But in Vosges and Carinthia, the church bells fly around bringing Easter eggs! From Rome! This article talks a lot about various German customs like egg-tapping, and about the eggs that the hens laid on Holy Thursday being seen as particularly blessed. One of the ancient laws of the Internet is that posts which correct other posts are prone to introduce their own brand new errors. Spelling corrections tend to include spelling errors, grammar corrections include grammar errors, and factchecking tends to produce huge new factual errors. Ted Cruz said that he thought “the Body of Christ should rise up” and support him, as the best Christian candidate. Over at Get Religion, David Mattingly made a comment explaining the biblical context, as did Get Religion alumna Mollie Ziegler Hemingway over on The Federalist. But both columnists proceeded to say that calling Christians “the Body of Christ” was strictly metaphorical! And what’s worse, Mattingly dragged the Pope into this, which made it seem like the Pope would agree! Now, Cruz is a Baptist of some stripe, and therefore it’s possible that “a metaphor” is exactly his interpretation of Paul’s passages concerning that. But the Catholic Church does not take it that way. Christians are mystically (ie, in a hidden or non-obvious way) part of the Body of Christ. In Baptism, our own lives died, and we took on His life. We eat His flesh and drink His blood, which nourishes His life within us. We can communicate directly with Christ our Head, as well as with other members (ie, body parts) of the Body who are with Him in heaven. The more Christlike we become in conduct, the more our bodies and souls become like His. In extreme cases, we can suffer His injuries as stigmata, or do His miracles, or have our bodies fail to suffer decay after death. Also, a lot of people were quoting the relevant passage of Romans, but the really relevant passage was in Acts, where Jesus appears to Saul on the road to Damascus aand asks him, “Saul, Saul, why do you persecute Me?” Saul/Paul had been persecuting Christ-followers, not Jesus – unless Jesus was speaking the stone cold truth about His mystical relationship to His followers. He got the idea of the Body of Christ from that, and obviously didn’t think the biggest learning experience of his life was a metaphor. So no, it’s not a metaphor.